Make your site go viral by requiring your users to Facebook Like, Google+1 or Tweet about your site to reveal premium content. Simply wrap the content you want to protect with the [viral-lock] shortcode and the content will be protected until the users shares your page. 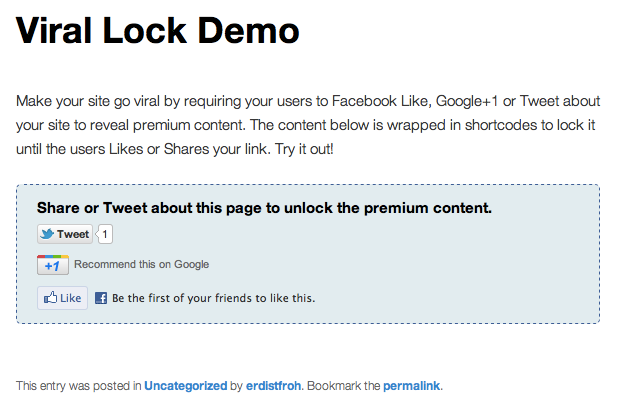 Viral-Lock is the first of its kind to combine Facebook, Google+ and Twitter to give maximal viral impact. More likes and tweets = More money for you. Click here to try the live demo. As requested we have added the possibility to have separate links for the different social networks. As requested we have added an optional parameter to unlock more then one lock with just one like or share. As requested we have added a parameter to customize the message sent to Twitter. Use the lock icon to add a Viral Lock shortcode. 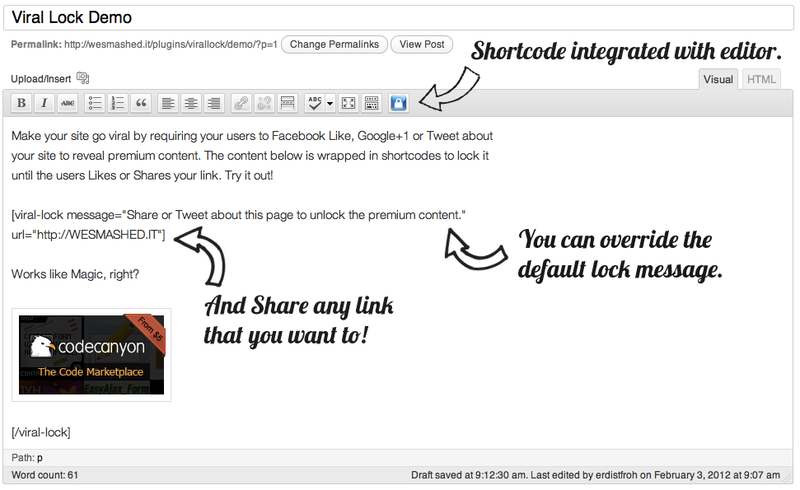 You can use the different shortcode options to specify a custom message and link to share. Our plugins are W3C validated and tested in multiple browsers to make sure that your plugin always works great despite which browsers your visitors are using. If you have purchased this item and need support then please write in our support forums and not in the comments. If you have a pre-sale questions then please use the comments section. Premium content e.g. tutorials, e-books and guides etc. Or any other content, links and much more. Make your site go viral today!